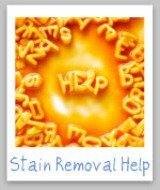 Stain Rx is a stain remover which is designed to remove some really tough stains such as iodine, blood, berries and wine. I've put the claims to the test, and you can see my results below to find out how well it really works for removing tough stains from your clothes. We all know that stain removers say they can remove all kinds of stains, but often we are disappointed with the results, so I've started the process of testing lots of different stain removers, to tell you which are best for various jobs. This time, I put Stain Rx (previously known as Erado-Sol) through the paces to see how well it really works. On the bottle it says it can remove "wine, berries, coffee, blood, iodine, and hair dye stains." Therefore, I focused mainly on these types of stains, with a couple other mixed in too. For my testing I received two 3.75 fluid ounce bottles of the product from the company, along with two one ounce bottles (not pictured). As you will see below, I tested quite a variety of stains, and used it for quite a number of washes and still ended up using only about half of one of the big bottles. Therefore, I'd say a little goes a long way. 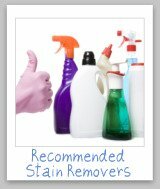 That is a good thing, because this stain remover is on the expensive side. 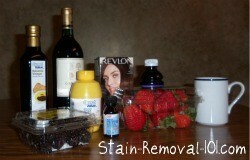 I then gathered up a few products which cause some major staining problems, including balsalmic vinegar, red wine, mustard, hair dye, iodine, coffee, grape juice, blackberries, and strawberries. Also, not pictured are the grass and blood stain materials (what I do for this site!). 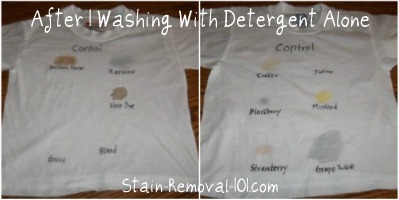 Next, as you can see below I used some white t-shirts and stained them with the products. I labeled the stains with permanent marker, and said whether each shirt was the Stain Rx or control. (See pictures below.) Then, ignoring the instructions of the product instructions I let the stains sit for 24 hours before I did anything to them. The reason I let the stains sit for 24 hours was to give the product a really hard test. 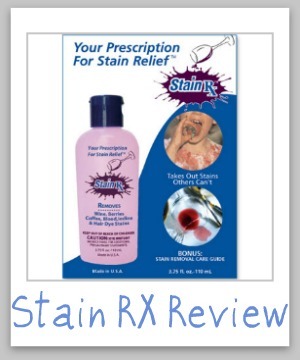 I wanted the stains to really be set in before Stain Rx went to work on them, because many products can remove a stain that is immediately treated. To be fair, for many of the stains I tried this product on, the instructions explicitly said it works best on "fresh" stains, such as for coffee, and hair dye. So, this may have skewed the test results a bit, but I wanted to have a more real life situation for testing. The control shirts were washed in just detergent (specifically Tide Free and Gentle), without pretreating with any laundry stain removers. Below are pictures of the results I got just by washing with the detergent alone. What really suprised me was that the iodine came right out, completely! Normally that is a very hard stain to remove, so I am suprised. In addition, you can see that both the grass stain and blood stain mainly came out (hard to tell in picture, but there is still some faint remnants of those stains). Further, the other stains are all still visible, with both the red wine and grape juice having a signature bluish stain left. 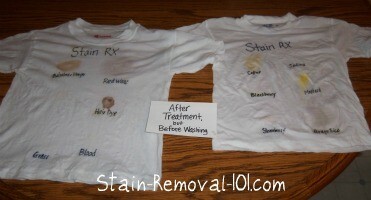 Next, I pretreated all the stains on the Stain Rx shirts with the product, as instructed. Therefore, I wet each stain with cold water and then treated it with some Stain Rx. For a couple of the stains, including mustard, grass, blood, and balsalmic vinegar I also gently massaged the stain, since the instructions suggested this (I used an old toothbrush for this purpose). Please note, because my shirts were white I did not need to check for colorfastness in an inconspicuous area before using the product on them, but the instructions say to do so when using it on colored items. I immediately noted the strong scent from the product when I first applied it to the stains. The product refers to the scent as a "Spring Fresh Scent," but to me it was just very overpowering. Of course, I prefer hypoallergenic products, so I don't like much scent at all. However, I had to turn on the exhaust fan in my bathroom where I was working, and the scent did not dissipate for several hours. Even my husband, who wasn't involved in the testing, commented on the scent. I wish I had been video taping while I applied the Stain Rx, because the iodine completely disappeared before my eyes as I dripped the product onto it. Although in my test the iodine came out in the wash without the stain remover, I can imagine that Stain Rx would be very good to use for iodine stains on carpet and upholstery where you cannot launder them. In addition, after treatment with the product, but before I even washed them, the blood and grass stains were completely gone and the berry stains had lightened significantly. The berry stains also visibly reduced as I dripped it on, but where I had really ground in the berry there was still a mark on the fabric. Further, both the red wine and grape juice stains has visibly lightened, although there was still a bluish cast on the shirt from them (that disappeared with washing though -- see below). This makes me wonder how well the product would do on wine stains on the carpet though, because you could not continue to the step of washing with those types of stains. Above is a picture of the shirts after treatment with Stain Rx, but before washing. Next, in the picture to the left you see the results afer I washed the shirts. Before washing I rinsed away the Stain Rx, as instructed, and then threw them in the washing machine with the same detergent as the control test shirts. Some of the stains just didn't come out though, such as the balsalmic vinegar, coffee, mustard and hair dye. I decided to treat with the Stain Rx again for these stains, to see if there would be additional improvement. To the right is a picture of the shirts again, this time after 3 treatments with Stain Rx, and 3 washings. As you can see, the stains that didn't come out, still didn't come out although all were lightened further. 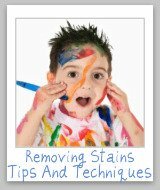 Therefore, I wouldn't recommend Stain Rx for these types of stains, with the exception of hair dye stains. To be fair, hair dye is very tough to remove, and I let the stain sit on the shirt for 24 hours before trying to treat it. Ideally, as soon as you dripped hair dye on yourself you would whip out a stain remover and begin treatment immediately. Even though I let the stain sit for so long after three treatments with Stain Rx there was a significant, noticeable lightening of the hair dye stain in comparison to the control shirt (see picture to the left). Not many products would have even given me that good of a result after such a long period letting the hair dye set into the shirt. Next time I'm testing some products to remove hair dye stains, I want to test this one again, testing it immediately after I splatter the shirt to see how it works then. Once I do, I'll update this page, but I wouldn't say it doesn't work at all on hair dye stains yet, because of the way I tested. I've not personally seen this product in any store. Instead, it is available for purchase online, such as through Amazon. 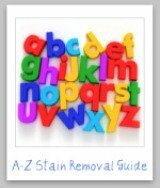 Overall, I was very impressed with Stain Rx with regard to a couple of very hard stains to remove. I do believe it will be included in my arsenal of stain removers for removing wine, iodine, berries and blood from now on. I do hope they come out with a scent free version though, since the odor was a bit strong for my taste! 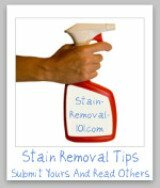 Have you used this stain remover on your clothes, carpet, upholstery or other places in your home? If so, I want to know how it has worked for you. You can share your review below. Remember, photographs are not required, but they are encouraged, especially if helps us understand your review better. Your review will appear on a Web page exactly the way you enter it here. You can use some basic HTML if you wish, but it is not required. Click the links below to see reviews already submitted by others. Feel free to comment on any of these submissions if you've got something to say. Pursuant to FTC rules and regulations, please note that I was provided with free samples of this product for review, and also compensated for my time in making this thorough review of the product. My opinions and test results are completely my own, however, and have not been influenced in any way.